Qualcomm surprised us all with a new mid-range chipset shortly after the release of the Snapdragon 710 but this time it's a brand new addition to the Snapdragon 600-series and it's a direct successor to the Snapdragon 660. However, the Snapdragon 670 has more in common with the Snapdragon 710 than its forerunner. In fact, if you look at the specs sheet it's really easy to mix them up. Just like the SD710, the SD670 comes with octa-core CPU with the exact same core configuration - two big cores and six power-efficient ones - 2x Kryo 360 + 6x Kryo 360. 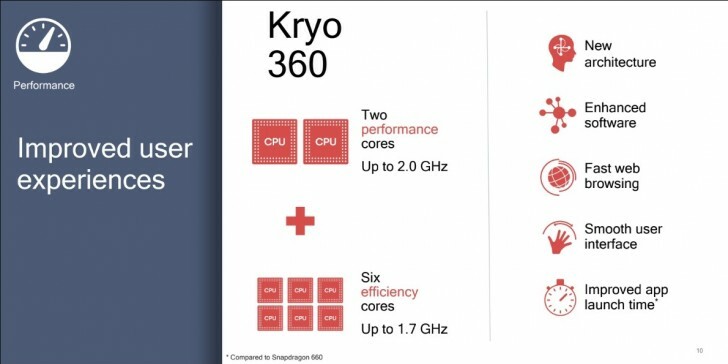 The two big Kryo 360 cores are based on the Cortex-A75 architecture while the small ones borrow the Cortex-A55's design. But contrary to the SD710, the SD670's big cores are downclocked to 2.0GHz while the small ones are still running at 1.7GHz. With this in mind, we expect the multi-core performance to be just about the same as the Snapdragon 660 since the latter incorporates four instead of two big cores. However, Qualcomm claims that the SD670 offers 25% better performance over the SD660 while the SD710 is 35% faster compared to the SD660. The key advantage of the SD670 over its predecessor is the 10nm LPP manufacturing process (the SD710 is based on the same node, too). This should allow for significant power efficiency gains. Moreover, Qualcomm announced a new GPU called Adreno 615 but we don't know any specifics. We can only assume that it's inferior to the Adreno 616 found on the Snapdragon 710. 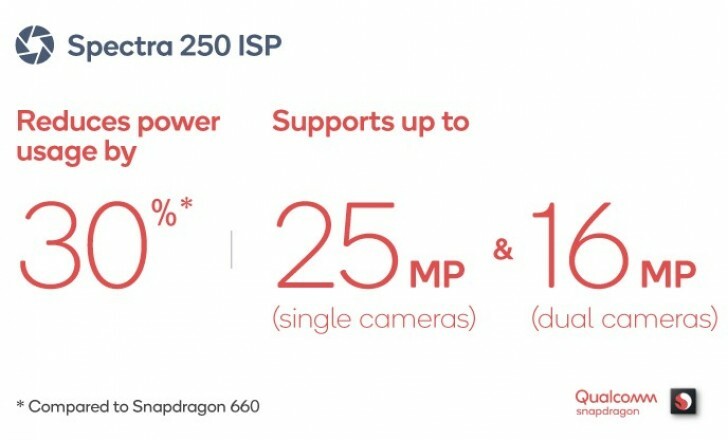 And although both SoCs share the same ISP, Spectra 250, due to the lower clock of the SD670, it can only take care of 25MP single camera or 16MP in a dual setup. It's also stripped off some features that are intrinsic to the higher-end chipsets. For example, HDR video recording isn't available and support for QHD+ displays is out of the question. Another downgrade from the SD710 is the modem - Snapdragon X12 LTE. In fact, it's the same one found on previous generation SD660. And last, but not least, the chipsets receives a brand new AI Engine like its bigger sibling to allow for better AI-driven features that weren't available before in the Snapdragon 600-series. The SoC is currently commercially available, so it's up to the manufacturers to utilize it. 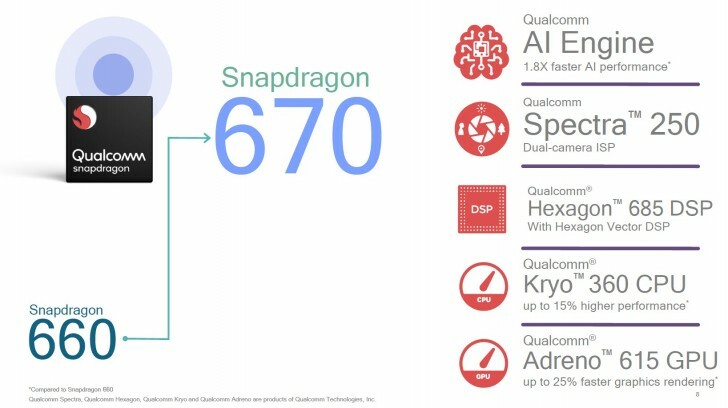 And interestingly enough, Qualcomm stressed on the fact that the Snapdragon 670 is an entirely different design from the Snapdragon 710 so we can expect it to arrive in even cheaper devices in the following months or weeks.